One of the pioneers of 3D casino graphics. Welcome bonus allows play on Craps. Accepts players from the US. Play Craps Now at 3Dice.com! The 3Dice casino was built to stand apart from the crowd. It was one of the first sites to really explore the potential of online casino graphics and insists on providing a fun environment to play. As well as a great selection of games including Vegas Style Craps, 3Dice gives attention to the social aspect by offering players a chat room in their client and forum on their website. In this review of 3Dice you can first find a quick overview of the company. 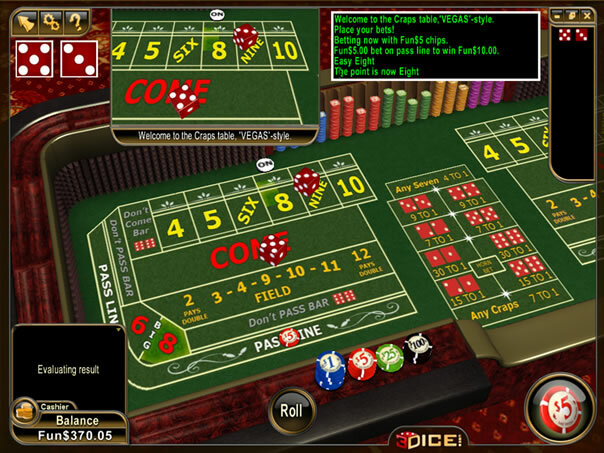 Then the Vegas Craps game is covered, looking at the graphics, odds and features you can find. After that the site’s bonus is covered before looking at banking options and the customer support. 3Dice Casino was launched in 2006 and is regulated by the Government of Curacao. It is operated by a subsidiary the Danmar Investment Group who has a long history in online gaming. 3Dice itself has built up a good reputation using its own software and serving players from around the world, including the US. The company aimed to break away from the uniform online casinos you can find, by being different and providing their own unique software client. When 3Dice’s software was first launched the polished 3D graphics were state of the art and while others have now caught up the client still stands up in the modern market. 3Dice operate a proprietary software platform which you can download onto your PC. While the lobby looks a bit dated the in-game graphics for the Vegas Style Craps game still look impressive and all the information you need is clearly presented on the screen. There is a ‘close up’ window which tracks the dice as they roll, which is a bit unnecessary, although when you point at different areas on the table the window does zoom in and show you the payoffs you can get. Bets can be placed by selecting the chip denominations and then clicking on the betting area. If you want to reduce of clear a bet you just right click on the stack. When a new opportunity to bet arises that area is highlighted so you know what bets are available. Off to the right, for those who like to track the numbers rolled, you can see the last 9 results. Once you are in the points round you can have the option of betting 3x Odds. The point pays out at 2:1 for 4 & 10, 3:2 for 5 & 9 and 6:5 for 6 & 9. The field bet pays out even money with double for 2 & 12. Off to the right of the screen you can see your Hardway bets, Horn Bet and other Proposition bets which give you the normal bad deal, although feel free to add them in for fun. The default table limit on 3Dice is $2000 to cover all bets and each field is limited to a maximum bet of $50, which includes bets placed on pass line odds. Throughout the game the dealer voice keeps you apprised of the action, although you can turn it off in the settings if you wish. New signups to 3Dice can get a standard 110% Bonus up to $100. While this is not the biggest offer out there the terms are very reasonable and the great news is you can play Craps to clear a portion of it. In order to release the bonus you must play-through 30x the total of the deposit and bonus amounts. While Craps can only account for 25% of the betting requirements all games are eligible for different percentages, including low variance games like Baccarat, Blackjack and Roulette. After this bonus is cleared there are ongoing random draw bonuses to look forward to along with the loyalty scheme, which unlocks cash and prizes the more you play. For High Rollers there is a separate bonus package where you can release up to $500. 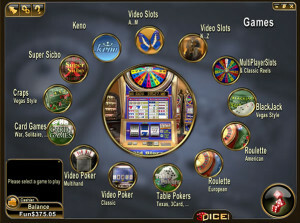 3Dice hosts over 80 games in total with a range of slots alongside traditional casino table games. 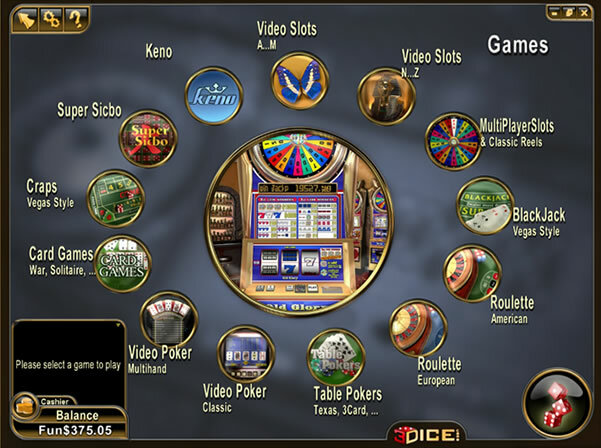 Some of the slots do appear slightly old hat compared to the offerings of the bigger software houses, although the table games in particular have a real slick look and feel to them. There are a wide range of deposit and withdrawal methods available at 3Dice, although not all may be available in your country. These are all listed under the Cashier tab on their website however some information is slightly off with for example Neteller and Paysafecard being listed as international options when they are not accessible to US customers. The site also accepts popular methods like credit cards, checks and bank wires for deposits and withdrawals, which most customers should be able to use. It is stated that there may be up to 24hrs before withdrawals are processed and after that the expected time for processes are clearly stated on the site, with none going over 5 working days. Customer support is available 24/7 should you have any problems with this or any other aspect of 3Dice and can be contacted via live chat or a toll free US number. If you prefer to email a list of addresses are available to quickly get your query to the right department. 3Dice is a very impressive stand-alone site which accepts US players. Fun features like the lobby chat help keep an enjoyable and sociable feel while the games themselves look fantastic and operate really well. Despite a few errors on the site and a couple of areas that feel a bit old now, 3Dice is one of the few sites that permits Craps to be played to clear a reasonable bonus. 3Dice has a long proven history and still remains great a site to enjoy Craps. Innovator in the online casino industry. Bonus allows play on Craps. Some errors and outdated sofware elements.